This sandwich is a twist on the classic French sandwich the Croque Madame (similar to the Croque Monsieur). If you are not familiar with this amazing sandwich I first discovered the Croque Madame while on study abroad in Paris. 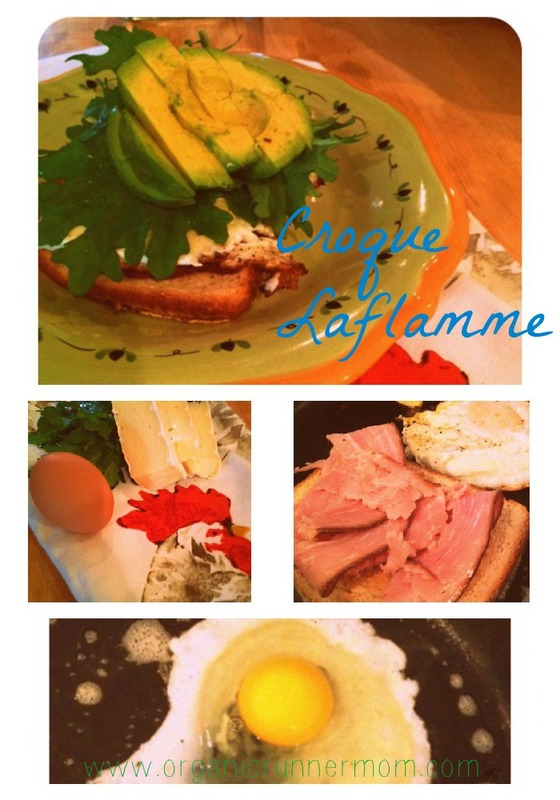 A Croque Madame is a grilled ham and cheese with a fried or poached egg on top. The egg on the sandwich is said to represent a woman’s hat. The original Croque Madame featured Gruyere Cheese or Emmental Cheese and can now be easily found in the lovely street cafés throughout Paris. My vegetable garden is beginning to overflow with fresh vegetables. The baby Kale which I planted in my raised beds is organic (the seeds are High Mowing Organic seeds). I like baby Kale because the texture is not as tough as regular Kale and the flavor is more delicate. baby Kale seemed like a delicious complement to the rich flavors of the Pete and Gerry’s Organic Egg yolk, the North Country Smokehouse Bistro Ham, Brie cheese and avocado. I carefully fried my egg to a nice over-medium in my cast-iron skillet in butter (just perfect to soak up with the toasted Oatmeal Bread). I lightly toasted my oatmeal bread and added it to the skillet. I carefully built my sandwich adding the Bistro Ham first, then the Fried egg, and 3 pieces of Brie cheese on top. The Brie Cheese warmed until it was just beginning to melt. I then plated my sandwich. Added Kale and Avocado and another slice of bread on top. The end result was a sandwich featuring the creamy flavors of the egg yolk, brie, and avocado, rich bold smoky ham and fresh baby Kale. If you are looking forward to a sandwich for your next Brunch or the next time that you have guests over for lunch I would add this one to your menu.